What can be said about my first AB show. At this point, I'd been a fan for 10 years and was aching desperately to get to a show. Unfortunately not a single friend of mine was into the band and I never felt right going alone. Finally in college, I discovered a pal who was almost as into the band as I was and we NEEDED to go to this. We bought our tickets, and about a week before the show impulsively purchased VIP upgrades. Needless to say, it was going to be AB overload that day. We got our exclusive meet and greet, sound check access, all the VIP goodies. For sound check I immediately darted to the front of the stage and pressed myself against the railing. 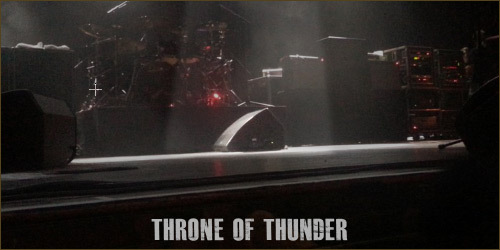 I chose to stand between the right and center microphone stands, where Myles spends most of time commanding the stage. I did not move for the remainder of the evening. Not even to use the restroom. I came to be front and center and scream every word of every song that's played such a pivotal role of my adolescence, and that's exactly what happened. As I said before, it was such sensory overload. From only dreaming of seeing a show to getting to go, meet the band, and be front row - it was incredible. To cap it off, I managed to get a Myles used guitar pick - with the Ramone's inspired Conspirators logo during his runs with Slash. Looks like the boys are booked through 2016 in Europe, but with 2017 brings the hope of another US tour in support of The Last Hero. And I will be there front and center just as before. Thanks for sharing! I'm still a little miffed I ended up missing this one. I live in the Philly area so the Starland Ballroom is a fairly quick drive. Both fortunately and unfortunately for me, I was on my honeymoon at the time. However I was lucky enough to see them there back in 2005, and I saw Tremonti there last year as well! Any favorite songs of the night?